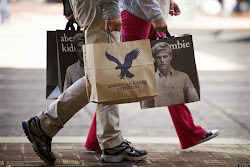 The slow decline of teen brands such as Abercrombie and Fitch, American Eagle, Hollister and Aeropostale deceptively correlates to the Great Recession overstating its economics role in their dwindling market value. This correlation has caused most of the articles I've read about to be overcast with the same stubborn rhetoric of economic struggles being the sole catalyst to this dramatic shift in consumer behavior. These articles repeatedly emphasize the low cost of the ascendant brand, Forever 21 without adding more context. The words cheap and fast fashion have co-opted Forever 21's complex narrative and thus has camouflaged how the interaction between economic events and cultural shifts fueled their growth. The Great Recession has subtly increased the importance of psychological and esteem effects of fashion thus intensifying the need for the perfect purchase. This psychological pressure has changed shopping behavior. The combination of low cost and fast fashion has made shopping even more gratifying in difficult financial times. Washington Post noted Forever 21's and similar brands' ability to quickly add new styles to stores shelves. Social media is a tool for aiding teens to meet this demand. Marcie Merriman, a consumer-engagement consultant at Ernst and Young, observed to Washington Post "these young consumers are shopping by seeing what's on Instagram, Facebook, Twitter -they're sharing on a constant basis, it's always around them." Social reviews have become more significant and reviews derived from social media are perceived as being more trustworthy and appealing. Enter the perfect antidote to this dilemma ...the shopping haul, brought to you by YouTube, where beauty and fashion gurus offer expert visual reviews and style tips teens can trust. Teens aren't just taking advice for anyone but familiar fashion elites online. The teens can experience the thrill at home and participate in new trends before investing in clothing that could disappoint or waste money. Buyers regret is a thing of the past. When most of articles gawk at Forever 21's mysterious 82 percent rise from 2007-2012 and only see the Great Recession, I think of the explosion of YouTube (founded in 2005) and its accompanying novel phenomenons such as shopping hauls( which began around 2007 according to Wikipedia). YouTube beauty and fashion gurus, such as Michelle Phan and Blair Fowler, accidentally became internet famous. Elle Fowler admitted to ABC News she didn't even expect anyone to see her video (by the way ....ABC featured them at Forever 21). Teens and young adults were hooked on these YouTube gurus and ready to eat up what was served in a shopping haul. Whatever brands that were lucky to be connected to this organic movement would had exploded with this phenomenon and profited handsomely even if their website temporarily was knocked offline by the stampede. These teens were moving away from a culture of inaccessibility and exclusivity to cheerful and helpful fashion advice from YouTube gurus such as Bethany Mota. When talking about Bethany Mota, Meleina McCann, 15, of Oakland California told Business Insider "she's super sweet and so relatable. Her videos are so personal. It feels like she's speaking to me." Her friend Ella Philips, agreed and added "She's always laughing and smiling." Who Are You Attracting to Your Brand? Forever 21 unexpectedly benefited from an organic turn of events from ambitious and passionate YouTube fashion and beauty gurus. 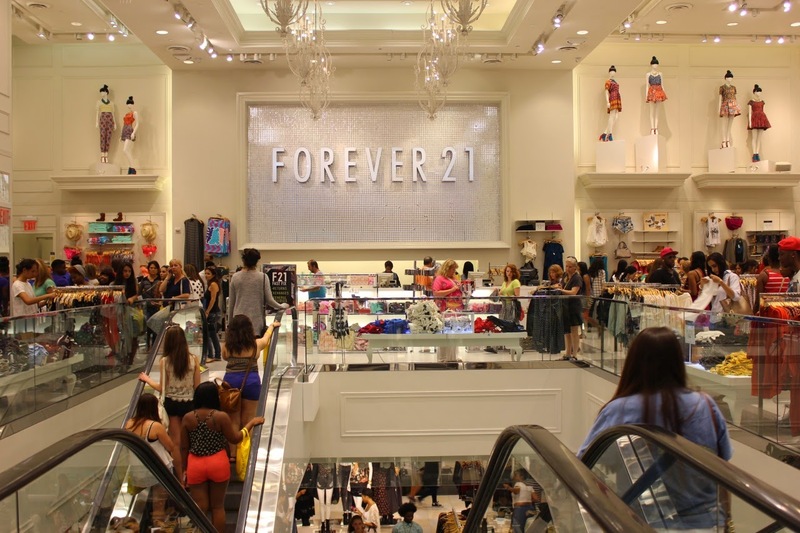 Forever 21's apparel attracted budding YouTube stars who were fast tracking to the top such as Bethany Mota and Blair Fowler just when the shopping haul faze mushroomed (around 2010 when it came to be a part of online consciousness, as indicated with the parody YouTube account shopping haul which started in 2010. Also, Guru Gossip, a hate site, started in 2010 on its old domain name gurugossip.net. Parody and hate usually means a character or movement has achieved some notoriety). Personality tends to direct personal style and cause teens to gravitate to certain trends. Bethany Mota in a haul mentioned when talking about a dress, "that is literally me. It's perfection ...When I saw this I kind of squealed." Bethany Mota, who has an affinity for sunflowers and mac n cheese, describes her personal style as "definitely bohemian, so it has that laid-back kind of free-spirited vibe and it's also girly and very comfortable” and “Once in a while … a little edgy." With more Instagram followers than Vogue, Elle, Marie Claire, Glamour and Cosmopolitan combined, her personality aligns with brands such as Forever 21 (mentioned first), Urban Outfitters, H &M and then Aeropostale.She probably doesn't have much appreciation for the austere preppy look. As a YouTube guru she needs to showcase a brand whose new styles almost sparkle on camera, this is amateur lighting not a fashion shoot! Blair Fowler's energetic personality, southern aura and sophisticated taste lured her to the colorful and lacy Forever 21. These girls are the type of personalities and demographics that Abercrombie CEO, Mike Jeffries, scorned. YouTube gurus inherently goes against the establishment and standard definitions of coolness. For example, Michelle Phan never hesitates to rehash a victorious story about being rejected to work at a Lancome counter only to be wooed by them a paid endorser. Abercrombie and Fitch unjustly devalued these "uncool" bullied teens without caring about the ridiculous nuances of what can make a perfectly interesting kid be considered "uncool". Forever 21 also had small partnerships with these beauty gurus who were eager to nibble up any morsels of acknowledgement from national brands when these weren't being noticed by big brands. The blossoming stage is always the most exciting and these emotions were conveyed to the also budding audience, parched of new brands to complement their new media consumption habits. Aeropostale is now trying to capture this newness by desperately clawing into a cluttered space and maturing movement. According to Lisa Green, head of industry, fashion and luxury brands at Google there were 150,000 haul videos in 2010 but now in 2013 there were staggering 700,000. Aeropostale missed the time of YouTube before Vevo. Although promotion through Bethany Mota is high quality (as evidenced by the ton of haul showcasing Bethany Mota's clothing line at Aeropostale), she is being officially sponsored and Aeropastle is likely to be resented by the more mature audiences. Forever 21 was in an ideal position to attract online gurus because both reflected each other's budding stage, while Abercrombie and Fitch gloried into their callous arrogance and smug disdain. Blair Fowler and Bethany Mota decided to use Forever 21 to unveil their fashion sense, just when the height of their fame intersected with the highest possible innocence of the movement. These YouTube gurus preemptively introduced Forever 21 when their audiences weren't necessarily looking for that specific brand or even a shopping haul. They were the perfect channels for distributing new fashion tips. Bethany Mota's and Blair Fowler's first clothing haul exclusively featured Forever 21 adding to the excitement that they are not just doing makeup tutorials but are "hauling" audiences to new beauty adventures. Now that Bethany Mota is more famous, her authenticity and accessibility are slowly wearing off, giving Aeropostale the illusion of capturing the moment. - Girls who are serious about fashion and beauty latched on to YouTube hoping to soak up unique yet accessible style tips outside their immediate environment/circle. Many trends in fashion magazines are runway ready but not school ground ready. These girls probably have a ton of social influence in their communities, even if notoriety like Blair Fowler and Bethany Mota. YouTube gurus are more accessible than "the stars of street style blogosphere who tend to favor more unique or au courant looks” by profiling national brands. Bethany Mota and other top beauty gurus are cognizant of their broad reach and concentrate their support on national brands than could provide the au courant feeling. - YouTube provides authentic promotion and user driven advertising whose millions of views proliferate and penetrates into the deep cleavages of teen fashion world that generic advertisements and promotions from the professionals don't have the resources and insight to reach. This reach then moves offline (to people who don't even know about YouTube gurus) to create infectious trends, made even more contagious by brands, catering to fast fashion such as Forever 21. - Girls who are clueless about fashion gladly welcome, any appealing recommendations. If they followed beauty gurus especially in the 2007 through 2010 era, they would have been nurtured into Forever 21 by Bethany Mota and Blair Fowler. - One YouTube guru can inspire a cascade of videos for a particular brand. Then YouTube influences other social media platforms such as Tumblr and Instagram. - Reality TV has diminished the value of professional and programmed entertainment where the viewers passively consume a fantasy life. It is the devolution of the expert and/or out of reach and corrupted authority. Reality TV highlights interesting and infamous characters who would have been shrouded in obscurity before the 2000s. Reality TV has legitimized social media and even might have inspired its birth. It is less about talent and about personalities who present an aspirational lifestyle and/or whose life makes a bold statement. The personal nature of haul has a reality quality. Bethany Mota herself is inspired by the trajectory of Lauren Conrad's fashion career who started off as a reality star. The teens brands monopolized coolness with their logos strangling the visibility of other fashion brands. How do people know that it is Forever 21, there must have been some intention causing this explosion because they would not have been able to recognize Forever 21 among other brands. 1. Fall Clothing Haul! Forever 21, H&M, Urban Outfitters & more! I choose Hollister as the "teen brand" to compare with because it has the highest amount of haul videos compared to the other teen brands. Many of the Aeropostale haul videos with the most reviews were driven by the mention of Bethany Mota. Many of the Hollister haul videos were clustered with other brands...yes especially Forever 21. I excluded two that were titled in another language. Will New gTLDS be Profitable Investments? Will they Sell and Scale? The introduction of new gtlds is routinely compared to the advent of the dot com and its widespread adoption by the public, even the less tech savvy. However these comparisons are somewhat baseless and deceptive because we can't assume that the new gltds will have the same type of success as dot com or dethrone its significance without considering the differences in conditions and studying the interaction of circumstances that led to the dot com boom. For example, domain and website companies didn't need cumbersome separate advertising expenditures to vouch for the dot com; it was simply how you got online. Companies just needed to advertise the benefits of developing a website, generate excitement to be a part of the internet and it was inferred that a dot com meant a credible web presence. Also, the 90's were a supremely different economically and culturally than now. To not openly acknowledge this and tout new gltds as a new innovation that is supplying assumed customer demand, which has vastly evolved, is quasi fraudulent. There are several obstacles that need to be confronted before presuming new gtlds will scale and be consistently used by millions and not just thousands of stale investments. Old model of online ventures is saturated: New gltds are mismatched with their market and doesn't directly cater to the appropriate demographics. In the 90's, the internet was unfettered territory and thus there were high incentives for early adopters to compete. New gltds will have competition with millions of dot com websites. Acquiring a domain name is the least of their problems. Since the old model of online ventures is saturated, the high tech skilled entrepreneurs are moving on to more profitable and less competitive ventures such as apps. For ambitious entrepreneurs that still desire to build a platform online, we can't assume that an appealing domain name is the highest barrier to entry but rather an exciting, innovative idea or concept that attracts investors. Also ambitious individuals with technical skills have cushy and prestigious career opportunities that sharply diminishes the need to embark on the perilous startup journey. In the 90's, the tech industry was still blossoming but now they are billion dollar industries that are extracting the top tech talent from the job and start-up market, and possible customers for new gtlds. Need small and midsize businesses use but these demographics are difficult to reach: Small and midsized businesses can intimately scale new gtlds to individuals by word of mouth and by example. However before this commences there needs to be initiative from renowned companies widely recognized and even celebrated as industry leaders with the disposable revenue and talent to make the risky investment. Once industry leaders take the plunge, admiring and competitive small and midsize businesses will be more eager to follow along to as the community and regional innovator. Industry leaders transfer importance, trust and prestige to new developments while traditional small and midsize businesses don't have the clout, recognition and budgets to buffer the risk and burden of getting the nation to adopt a new developments. However the outlook for this initiative by industry leaders are dim since they are settled in and invested in dot coms. The future for dot brand, like .google, appears very promising but they eclipse the budget of small and midsize businesses. Since these companies probably won't win privileged and exclusive control of dot generics, like Amazon in the .book debacle, they have hardly any vested interest in guaranteeing its success. The fact that industry leaders are not moving to new gtlds sends an implicit message about their lack of significance. It exposes new gltds as the cheap option compared to dot com or dot brand and to be avoided especially since small and midsize businesses have to work harder to gain status and legitimacy. If industry leaders are not heavily involved then under-resourced and time constrained small and midsize businesses won't have the adequate guidance on how to use new gtlds. Claiming new gtlds will have widespread adoption also ignores the predominance of social media site such as Tumblr. Before there were active fan sites for celebrities now it is official Facebook pages and Twitter. Before there were personal bloggers and now there's Instagram where people can showcase their lives like a glossy lifestyle magazine. Social media takes a huge chunk out of key demographics that would build visible and active websites on new gtlds. Needs widespread authentic use to build prestige, trust and familiarity: The advent of the dot com and even dot edu resulted in naive, non-scripted and experimental success stories of early adopters that convinced others to overcome their hesitation. Many did not know about domain investing and ironically that's precisely why the dot com begin to build in value after several years because value comes from use. Without the eventual and widespread authentic use of dot com, generic domain names such as finance.com would have never been valuable. Visible and admirable success stories centered on new gtlds risk being overwhelmed and crowded out by more established dot com websites that have a 10 year head start. While dot com hit the ground running, new gltds appear stunted in their authentic use since the majority are being held as an investment or to redirect to dot coms. Some critics of dot com explain that dot com means nothing and generic domain names adds meaning and trust for new visitors. However that is beauty of dot com, it focuses the visitor's attention on the brand and not being defined by a generic word that could already have negative, bland or unsettling associations and connotations. The structure of new gtlds dilutes that possibly of branding. They are too limiting and suffocates the prospect of expanding. Lack of branding also indicates low status and will not be an viable or attractive option for those seriously considering a name space as a platform. Stability and long term use is also required to add prestige and trust to new gltds. If popular websites simply move on to dot com once they save enough money, like del.icio.us moved on to dot com, that uplifts and reinforces dot com as the pinnacle. This behavior influences other webmasters with new gltds that it isn't ideal for building a permanent platform but new gltds are just a starter platform. If malicious webmasters are disproportionately attracted to the preemptive meaning from new gltds this could compromise the aggregate trust in new gltds. Dot com namespace is able to absorb this predicament due to the trustworthiness of other websites that call dot com home. However new gtlds may not be able to absorb this threat and lose credibility. Just like co.cc was dropped from Google's search due to prevalence spammy sites, new gtlds could drop from user's trust. Being an expert in new gtlds require a new or modified skill set and perspective than dot com since circumstances are different. Keep this in mind as you invest. Some new gtlds will be more widely used than others due to the industry they appeal to and their unique needs. For example, some industries don't require or need branding, especially the ones that operate behind the scenes. While others just want complementary websites, as lovato.club is for demilovato.com. I doubt new gtlds, with the exception of .brand, will widely sell and scale outside of other domain investors; but culture evolves and the new generation could accommodate the inclusion of new gtlds. New gltds are still somewhat exciting. I have one and plan to register a couple more. did you like my bloggy jingo? Your language and your personal vocabulary have a major impact on how you view life. In fact language affects culture because it defines our emotions, social world and objects. Some phrases are not translatable. This results in one culture holding unique views about life that other cultures can’t comprehend. For example, Greece developed the origins for the term “democracy.” This single term, “dēmokratía” which means rule of the people, changed the course of history and spread freedom from dictatorship across the modern world. The words that you use to describe your industry and profession also play a role in how your conduct business. If you use uninspiring, overused words and phrases to define your industry, your professional endeavors may share the same lackluster characteristics. I’ve noticed that there are several popular phrases in the blogosphere that may trap some new bloggers. However, by eliminating these terms from their vocabulary, they could save their blog. However I have a different take on this. First you need identify your audience. Then you need to contemplate your mission, be honest about your passion, develop the personality of your blog and create engaging topics. Many well-known blogger experts direct you to find your golden niche. However niches can be too suffocating. What you want do to instead is create the golden brand. I say, be innovative! Come up with your own niche. Google didn’t go around chasing niches; their mission was to organize the internet. Steve Jobs wasn’t sitting around thinking…”hummm which niche should I chase? ?” instead he followed his passion and became competition for IBM. Content – Content is actually a pretty handy word. It’s great for referring to all forms of media. However whenever I am writing, I don’t think…"time update my blog with more content.” I believe it’s more effective to view your media in the same way that your audience does. When an audience is finished reading a prolific novel or watching an enchanting movie, they don’t say “whoa, that was great content!” Instead there are specific elements of the novel or movie that the audience has fallen in love with. Maybe it was the characters, the actors, or the songs or perhaps the story line. What can you make your audience fall in love with? Also, the word, “content” is bland and seems to remove all differentiation between media. 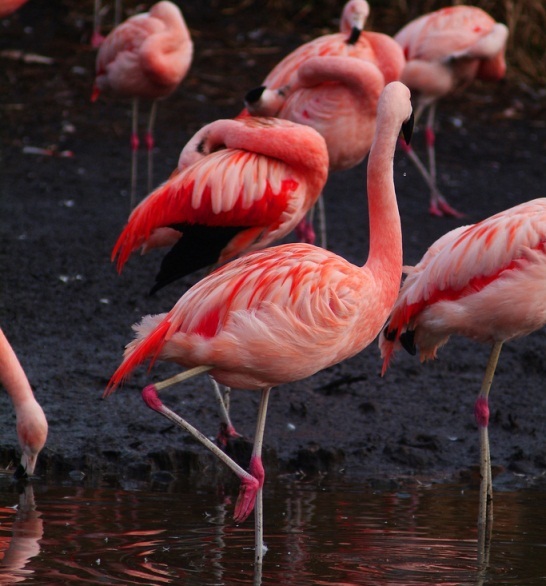 You don’t want your blog to be bland. You are a blogger, therefore you are writing blog posts not just content. You should be asking, what type of blog post am I writing? Will it be more journalistic, it is personable, it is satire or it is an interview? If you are doing a video, once again it’s not just content. It’s about whether you posting this video on YouTube, Viddy, Vimeo or offline. It’s about the differences between those audiences. It’s about your personality shining on this platform and your audiences getting to know you. I would rather you refer to your writing and the media you produce as art, than content. Yes, it’s a bit lofty, but art reminds you to display culture, provide meaning and have powerful expression. Call to Action – Have you seen those horribly design pages, with bright colors and a huge button that says “BUY NOW! !” or “CLICK NOW TO DOWNLOAD EBOOK!!”? I have and it’s never a pretty or inspiring sight. When you have a genuine connection with your readers and viewers, they automatically want to extend the connection. If you have a great blog, people will want to purchase your book for more exclusive thoughts from you. Of course, you may have an extra step that you want your audience to take. However, you aren’t entitled to anyone’s action. But you can inspire other to take the next step by offering value. You also can have a strategically designed page or blog that helps your audience take the next step. Monetize- Overall I think that the word monetize is extremely lazy. The word monetize causes me to imagine bloggers attempting to "passively" earn money from poorly done articles. If you can’t think of a creative way to earn money from your articles perhaps you shouldn’t be freelancing. You really should be thinking “how can I expand the brand? How can I create an adventure?” For example, Disney was able to develop an entire empire from his studios. He wanted to provide a family experience for his audience. He wasn’t sitting around confused about monetization. Modern bloggers forget the term starving artist and expect to earn too much too soon. When I think of a starving artist, I think of a person that has sacrificed so much and now they are desperate to earn a living. I don’t think of them casually asking, “I’ve sacrificed my life for my art…I wonder how I will monetize this.” Instead there was this huge conflict between maintaining their sense of self, pursuing their passion and having enough money to eat the next day. There is a depth in Edgar Allan Poe’s literature that captures the hearts of people worldwide yet he struggled financially. Do you really deserve to “monetize” your work? Then get creative. Traffic- The word “traffic” gives me the image of numbers without feelings, emotions or a personal story checking out your blog. However people are not just numbers, they are complex beings that are scrutinizing your work. They are people looking for entertainment, inspiration, information and an experience to share with their loved ones. The word can also be intimidating for new bloggers. They think “wait I need how much traffic to make money??!!! ?” Instead, new bloggers should be thinking about how many individuals they can make fall in love with their blog posts. It’s all about how you are making individuals feel. It’s not just about getting “traffic.” If you can make hundreds, thousands and even millions of individuals happy then you’ve achieved your goal. Now.. Are you ready to change to the course of your history?